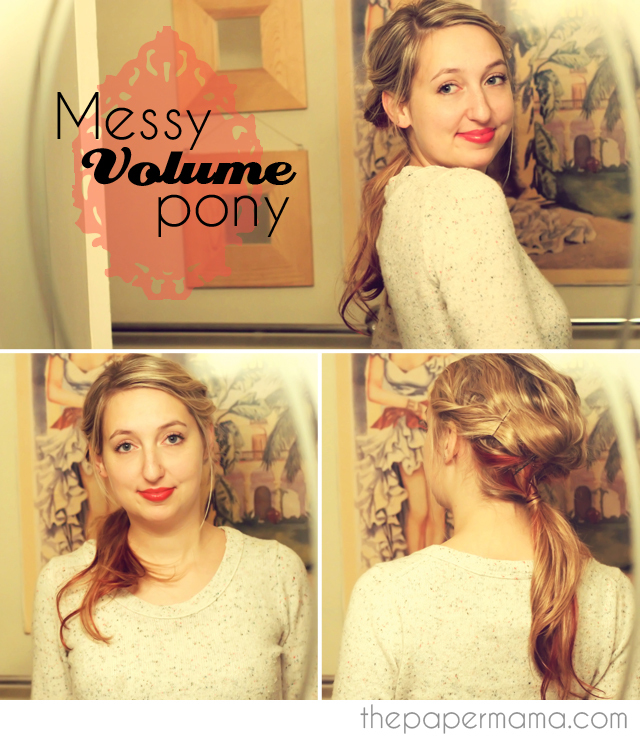 Today I wanted to share my Messy Volume Pony hair tutorial! and lovely way to wear your hair to all those holiday parties you will be attending in the next few weeks! It’s a style that can be accomplished using every day hair items you probably already have OR can buy for cheap. Because of my straight hair I started this hair style with the Sock Bun Curl that I put up the night before… so, in the morning I had wavy hair. Yay volume! Perfect for my Messy Volume Pony. Now, remember that this hair style should be messy! Don’t worry about the chunks of hair being uneven when you grab them. IT will still be lovely! 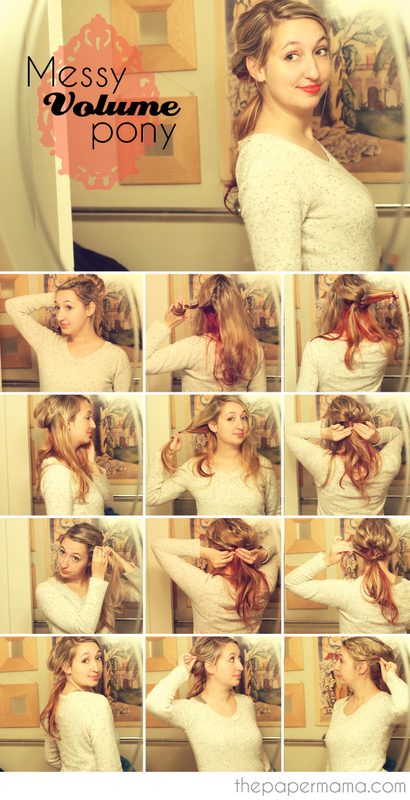 – Start with wavy/curly hair… I suggest the Sock Bun Curl or the No Heat Curl if you have straight hair. – Grab the back half of your hair… split it in half. Take one of those halves of hair…. push it up to give volume to the back of your head… pin that section of hair just above the nape of your neck. Repeat this step with the other half of hair. You should now have a lovely bit of volume on the back of your head (pictured above). – Now it’s time to pin back the front portion of your hair. The way you do this will all depend on if you have bangs or not. On one side of your head grab a chunk of hair… push it up to give it some volume… and pin that section of hair just above the nape of your neck. Repeat this on the other side of your head. BUT, if you have bangs (like I do) you may need to either braid your bangs (video tutorial here) or twist them like I do (pictured above). Pin that section of hair just above the nape of your neck. – You’re almost done! Grab a hair tie and gather up all the loose hair and make a pony tail at the nape of your neck. Optional: grab a tiny bit of ponytail hair and wrap it around the hair tie to cover it. – So, you can stop with the last step. BUT, I wanted to take it a little bit further. I wanted the hair on the sides of my head to be pinned a little better. To do this you can just pinch a bit of hair on each side of your head and pin it. Wherever you think it looks best! I am SO in love with this new hairstyle. Because I’m a mama… I often take my shower in the evenings when my hubby can watch Ruari. This makes it perfect for me to throw my hair up in the sock bun the night before and then creating this sweet Messy Volume Pony the next day with my curly hairs! OR, if you do shower in the morning… you could still do the Sock Bun in the morning and have curly hair in time for the evening. Then you can wear your Messy Volume Pony that night! Just ad some inexpensive makeup and a sweet little outfit…. ta dah! You’re ready for your party. Enjoy!